Chris Townsend Outdoors: The snow's here! Skis or snowshoes? 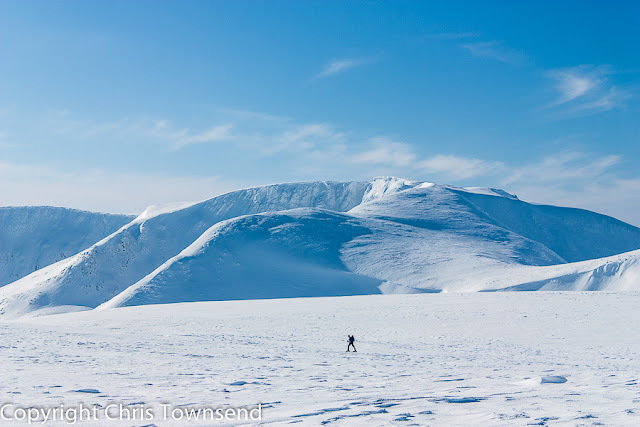 The first big snowfall of the winter combined with the arrival of a pair of snowshoes to try had me thinking about the advantages and disadvantages of skis and snowshoes. I use both and I like both but there are times when one is a better choice than the other. The big plus point for either is flotation on snow. 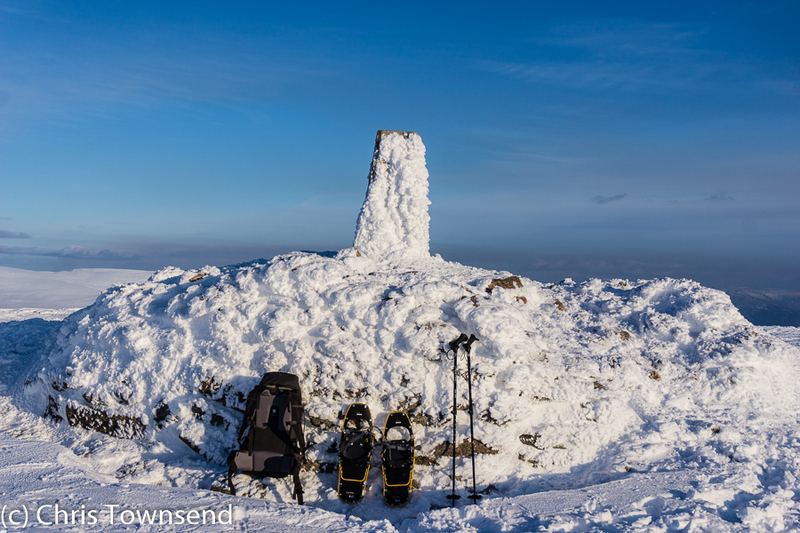 I reckon that once snow is more than halfway up your boots then walking starts to become arduous. Once it’s well above your boots walking is very arduous. When it approached knee-deep post-holing, as it’s known, becomes a great way to exhaust yourself and make your legs ache without actually getting very far. Stay on the surface and progress becomes much faster and less laborious. That’s where skis or snowshoes come in. I’m always surprised when the snow lies deep on the hills how few people I see using them. On snowshoes on the Pacific Crest Trail. No poles! 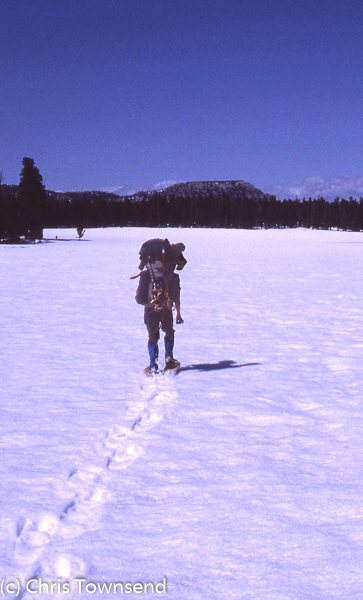 I discovered both snowshoeing and ski touring in California on the Pacific Crest Trail over thirty years ago. The mountains were deep in snow and post-holing over the small ranges in Southern California quickly taught me that I’d never get through the hundreds of miles of the much vaster High Sierra like that. American companions were using snowshoes and I could see just how much easier these made snow travel. For the High Sierra two of them swapped their snowshoes for cross-country skis. Learning to ski with a huge load whilst hiking the PCT didn’t seem a good idea so I bought some snowshoes and was very glad I did so as they enabled me to cross deep snowfields fairly easily. Skiing looked much more fun though and I was envious of my friends as they swooped off into the distance whenever the terrain allowed. The next winter I took a ski course. And fell in love with ski touring. This was the way to travel over snowy terrain! I then spent a decade leading ski tours, mostly in Norway, but twice back in the High Sierra. At home I skied in the hills whenever there was enough snow. For a while snowshoes were forgotten. Then a pair arrived for test and I discovered I did quite enjoy using them. 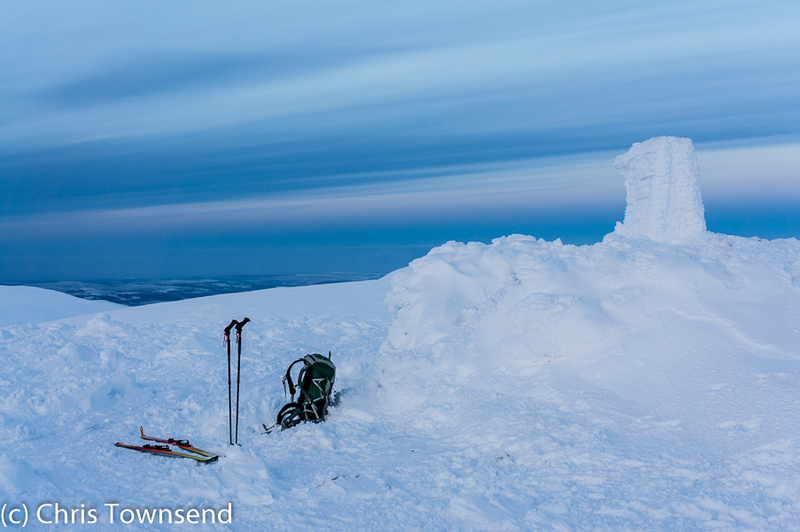 Since then whether I use skies or snowshoes depends on conditions. This is a key point. 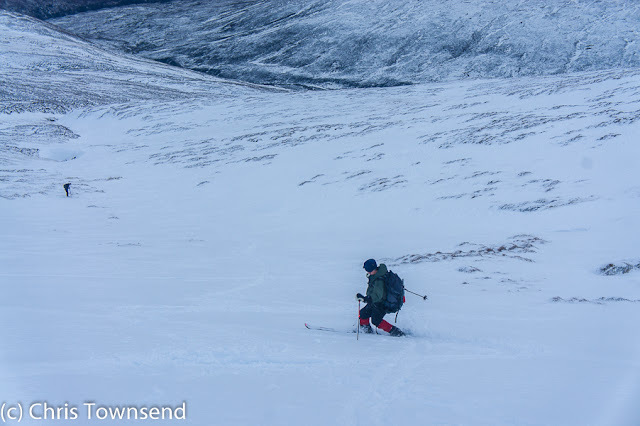 When there’s continuous or near continuous deep snow cover on the hills I much prefer skis – gliding over the snow gives a wonderful feeling of freedom, of lightness, of having escaped from being earthbound. However when the snow is broken and skis have to constantly come on and off or ways picked round rocks and convoluted routes devised to link snow patches then I prefer snowshoes. Whilst rocks and stones can wreck skis and skiing across anything other than snow is difficult snowshoes can be kept on regardless of the terrain. I’ve even forded streams in them. I like snowshoes in dense forests too as the length of skis can be unwieldy in the trees. If I have to walk far to and from the snow snowshoes are also better as they are much easier to carry on a pack and don’t act like a sail in the wind or catch in branches. Now if I reckon I’m not going to be on skis at least 75% of the time I take snowshoes. If you’ve never tried either snowshoeing is much easier to learn than skiing. Really, there’s nothing to it other than ensuring your feet are far enough apart that you don’t catch the snowshoes on each other. Mostly you just walk. Trekking or ski poles are a good idea – something I didn’t realise back in the High Sierra all those years ago – but no special gear is needed. You can wear your ordinary boots and snowshoes come with bindings built-in. This makes snowshoes much less expensive than skis too. And they’re also lighter weight. 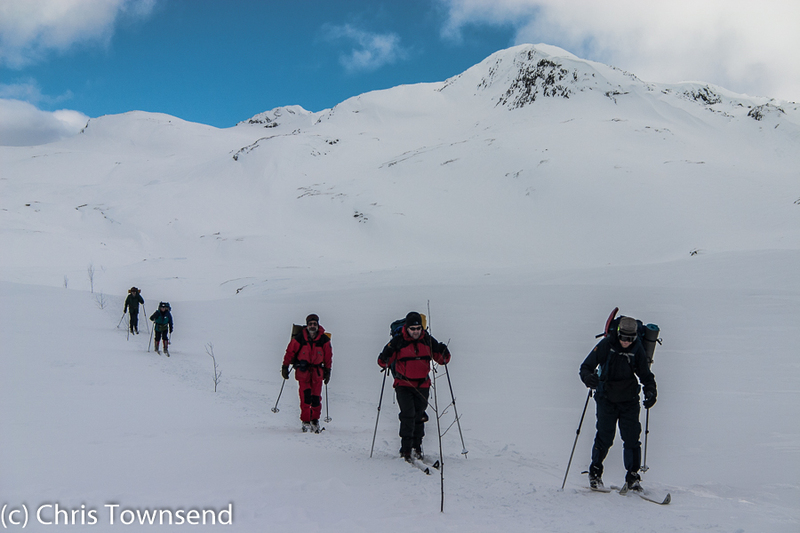 For ski touring you need boots, bindings and climbing skins as well as skis. Whether you choose Nordic or Alpine gear (I’ve always used the former) techniques take a little time to learn, which is best done on a course. 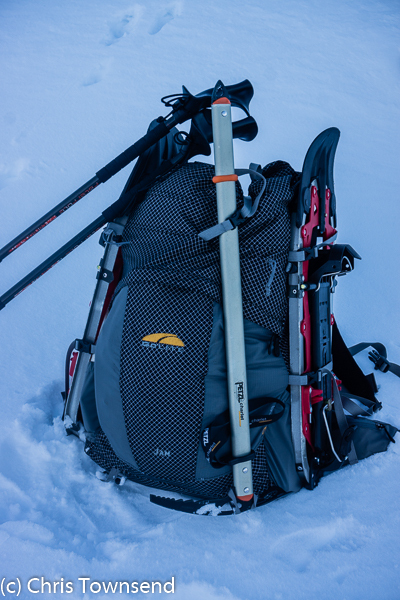 Whichever is chosen skis and snowshoes make snow travel much easier and much more enjoyable. I can’t imagine it without them. And tomorrow I’ll be trying out the new snowshoes.